What Happened to Natural Gas Prices at the End of 2018? Natural gas prices mirrored a rollercoaster during the last few months — lots of ups and downs. Let’s explore why. 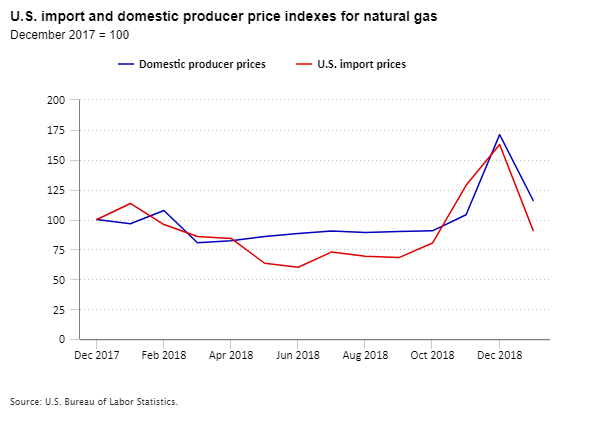 The U.S. Bureau of Labor Statistics publishes many indexes that measure changes in prices for natural gas. Producer Price Indexes and Import Price Indexes tell us about these and other price movements faced by U.S. businesses. Natural gas is critical to the U.S. economy, and changes in natural gas prices can have a large impact on our daily lives. You may use natural gas for cooking or heating your home, but did you know these facts about natural gas? Natural gas has surpassed coal as the largest source of electricity generation in the United States. The United States has become the world’s largest natural gas producer and consumer. Natural gas consumption in the United States reached historic highs in 2018. According to the U.S. Energy Information Administration, natural gas production reached record levels in 2018, driven by improved drilling techniques (such as hydraulic fracturing or “fracking”), more wells, and increased crude oil production. Natural gas can be produced either through direct extraction or as a byproduct of crude oil drilling. With more production, we might expect prices to fall because more natural gas is available on the market. Natural gas prices increased sharply in the fourth quarter of 2018, however. Let’s look at that rollercoaster of natural gas prices. In the early part of 2018, normal seasonal fluctuations and increased production pushed natural gas prices down. However, higher U.S. demand limited the decline in prices. Prices leveled off somewhat during the spring and summer months. Over the final 3 months of 2018, U.S. import prices for natural gas increased by 138.8 percent, the largest quarterly increase since the index began in 1982. Likewise, producer prices for natural gas increased by 90.2 percent over the same period. There were many reasons prices rose sharply in the last 3 months of 2018. The industrial and electric power sectors are the biggest users of natural gas. The record-high natural gas consumption in the United States in 2018 was driven by record-high demand from the electric power sector. Despite record production in 2018, natural gas storage stocks hit a 16-year low by the end of the year. More domestic consumption and increased exports cut into the natural gas inventory. That pushed prices up starting in October, but there were other reasons prices rose. An explosion of a major Canadian natural gas pipeline disrupted supply in mid-October. This explosion sharply limited U.S. imports of natural gas from Western Canada and reduced natural gas supply in the Northwest United States. Natural gas distributors asked customers to restrain usage, but import prices still rose. In November, imports from the pipeline grew to about half the amount before the explosion. Even though the natural gas supply from the pipeline moved toward full capacity in December, the demand for natural gas kept upward pressure on prices. California also experienced natural gas pipeline capacity and storage issues later in the year. Those issues pushed prices up for the entire West Coast region during the fourth quarter of 2018. Domestically, the increased demand for natural gas over the year resulted in the fourth lowest volume added into working stocks during the refill season since 2005. The refill season, typically April through October, is when natural gas supply typically outpaces demand, allowing working stocks to grow for the upcoming winter season. By November’s end, working gas stocks in the lower 48 states were below 3 trillion cubic feet for the first time since 2002 because of the depletion over the year. This lower supply, coupled with reduced imports, pushed domestic prices up as demand grew from electricity generation and heating needs from severe cold weather in most regions of the country. Prices then fell in January 2019. Import prices for natural gas decreased by 44.2 percent in January, and producer prices fell 32.2 percent. Imported natural gas from Western Canada returned to more normal levels in the first half of January. As a result, natural gas supply caught up to demand, pushing prices lower. In addition, warmer-than-average temperatures during the beginning of January limited demand for natural gas, also placing downward pressure on prices. Check out the most recent Producer Price Indexes news release and the U.S. Import and Export Price Indexes news release. Contact the Import/Export Price Indexes information staff at (202) 691-7101 or email us. Contact the Producer Price Indexes information staff at (202) 691-7705 or email us. How do prices for U.S. manufacturing exports compare to prices for goods manufactured abroad? How has the balance of export and import prices between the United States and Mexico changed over time? BLS has new measures to answer these and other questions on the competitiveness of U.S. production. We have published data on import and export price indexes since 1973. Since then we have made many improvements to the data we provide. Our latest improvements are the locality of destination export price indexes and the U.S. terms of trade indexes. What are the locality of destination indexes? Each locality of destination index measures price changes in dollars for U.S. goods exported to another country, region, or group of countries. These include major U.S. trade partners like China and the European Union. The indexes are available for all goods and for manufacturing and nonmanufacturing goods industries for some localities. The locality of destination indexes are a counterpart to the locality of origin import price indexes, which we have published since 1990. The locality of origin indexes let us examine price trends for goods imported from other countries, regions, and groups of countries. What do the locality of destination indexes tell us? The locality of destination indexes show how export price movements can vary depending on where U.S. goods are sold. For instance, from August to September 2018, prices for manufacturing exports to Latin America increased 0.3 percent. During the same period, manufacturing export prices to the European Union did not change. Comparing the two price movements, we can conclude market prices for U.S. exports arriving in Latin America increased relative to exports bound for Europe. Identifying these trends allows data users to dig deeper to see how currency exchange rates or shifts in global supply and demand affect price movements across trade partners. What are the terms of trade indexes? Each terms of trade index measures the purchasing power of U.S. exports, in terms of imports, for a specific country, region, or group of countries. In other words, the terms of trade index for China provides information on the price for exports to China, and how those export prices compare to prices for imports coming from China. Prices for exports and imports are measured in U.S. dollars, so exchange rates are already taken into account. We calculate the terms of trade index for China by dividing the China export index by the China import index, then multiplying by 100. An increase in the China terms of trade index means prices for exports to China are rising faster than prices for imports from China. What does a terms of trade index price change mean? A change in a terms of trade index provides information on the competitiveness of U.S. goods in the global market. Take the previous example, an increase in the China terms of trade index. U.S. producers are receiving higher prices for exported goods, meaning U.S. companies can now afford to purchase more imports. The U.S. terms of trade—or competitiveness—with China have improved. When looking at the trends, remember that the types of goods U.S. businesses export to and import from China are different, and underlying price changes may have different causes. How broad is the coverage of the terms of trade indexes? We publish the terms of trade indexes and the locality of destination indexes monthly. Data are available beginning with December 2017. Why did we develop these new indexes? The locality of destination and terms of trade indexes come from an ongoing effort to better measure the competitiveness of U.S. goods. We began expanding our measures of competitiveness in 2010 by extending the locality of origin import indexes to more detailed industries. Next we began work on the locality of destination and terms of trade indexes, eventually introducing them in September 2018. Check out the most recent U.S. Import and Export Price Indexes news release. See the charts we update each month on import and export price changes. Browse through our Frequently Asked Questions. Contact the information staff at (202) 691-7101 or email us. Why This Counts: What are the U.S. Import and Export Price Indexes? The U.S. Bureau of Labor Statistics provides data of all kinds for workers, jobseekers, students, employers, investors, and policymakers. Most BLS measures provide information on U.S. labor markets and living conditions: the national labor force participation rate; the unemployment rate in Illinois; the Consumer Price Index for Anchorage, Alaska. But did you know we also provide international data? With a focus on global trade, we publish the U.S. import and export price indexes. What are import and export prices indexes? Import and export price indexes describe changes in the prices for goods and some services exchanged between people and businesses in the United States and trading partners around the world. BLS collects prices of imported and exported products from businesses and calculates price trends monthly. BLS published the first import and export price indexes in 1973. We published the first all-goods price indexes for imports in 1983 and for exports in 1984. Monthly publication launched in 1989 and expanded in 1994. Import price indexes by country of origin began publication in 1992. What is an import? An export? 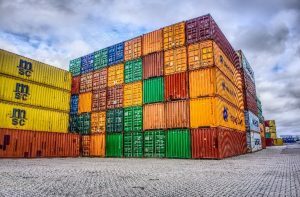 To measure import and export prices, we first need to define “import” and “export.” An import is any product entering the United States from a foreign country; an export goes the opposite direction. A good becomes an import or export when it crosses the border. An imported service is bought by a U.S. resident from a foreign resident, while an exported service is sold by a U.S. resident to a foreign resident. A price index measures the average change in prices for a basket of the same products over time. We measure price changes for thousands of imports and exports each month. We publish these price changes for specific products and for the specific industries and U.S trading partners that import or export the products. To learn more about price indexes, see our blog about the Producer Price Indexes. Like the Consumer Price Index and Producer Price Indexes, the import and export price indexes depend on the cooperation of businesses—in this case, U.S. establishments importing and exporting goods and services. Thousands of public-minded businesses voluntarily provide data through a monthly survey. With all the data we collect, we strive to minimize the burden on our respondents and protect their confidentiality and privacy. What do import and export prices measure? If you’ve ever taken an introductory economics course, you know markets determine price changes through supply and demand. On the most basic level, import and export price indexes measure how supply and demand affect prices for goods and services traded internationally. Let’s look at a quick example, the export price index for computers. A U.S. computer manufacturer may look at current trends to figure out short-term sales strategies. Then consider the flip side—the price index for import computers. A U.S. resident shopping for a new computer may want to research whether prices have risen or fallen over the past few months. Or that computer shopper might look at the data from the past few years to see if there is a certain time of year that prices fall. But the importance of import and export prices extends even further than individuals and companies. The indexes are used to account for inflation in other official U.S. statistics like trade balances published by the Census Bureau and the international accounts for U.S. Gross Domestic Product published by the Bureau of Economic Analysis. When economists calculate measures of U.S. industries’ competitiveness compared with our trading partners, they use import and export price indexes. A change in the import price index can tilt domestic inflation in the same direction. When exchange rates between currencies rise and fall, the indexes can show how much of that change is “passed-though” to an import or export price. Why do import and export price indexes data matter? The data matter because U.S. consumers depend on imports! Simply put, many of the products sold to consumers in the United States are imported from abroad. And there is a good chance what you buy for your home depends on import prices. But consumers aren’t the only ones who care about these prices. U.S. producers sell abroad and buy from overseas. Producers care about import prices because many imports to the United States go into the goods and services produced domestically. U.S. auto manufacturers care about the prices of auto parts they import from abroad. Producers who export goods to foreign countries benefit from having access to price information. Knowing trends in export agricultural prices, for example, could influence what crops a U.S. grower chooses to produce. Last spring I wrote about how we’ve been using more and better charts and maps to help you understand our statistics. Today I’m excited to tell you about a new set of graphical tools to make our news releases more illuminating at the moment of their posting. We want everyone to be able to “see” quickly what’s in the hundreds of news releases we publish every year—on price trends, pay and benefits, productivity, employment and unemployment, job openings and labor turnover, and other topics. The format of these news releases still typically includes a few pages of text to explain the latest information about a topic. Most releases also include tables with lots and lots of numbers. These news releases have served our customers well for decades, but we’re always looking for ways to improve our products and services. Many of you have told us that adding charts and maps to our news releases would make them more useful and easier to understand. In recent years we’ve added charts and maps to many news releases, but most releases only include a couple of these visualizations. We are committed to do more. We’re adding a cool new feature to many of our releases. Starting last fall, we began posting sets of interactive graphics to complement some of our most widely read economic reports. We’ll update these graphics with each new release of data. Our monthly news release on import and export price indexes was the first to have a set of interactive graphics. 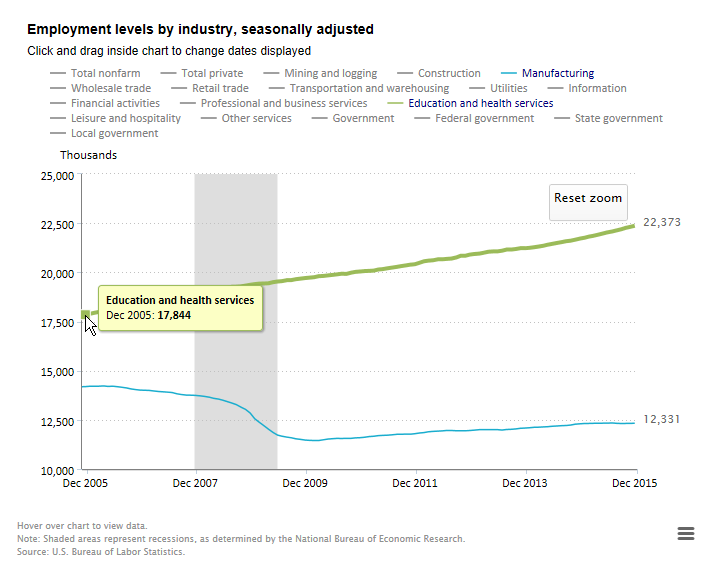 The quarterly Employment Cost Index news release was the next to include interactive graphics. Most recently, when we published the Employment Situation—often our most watched news release—on January 8, we presented a lengthy new set of charts from our monthly surveys of households and nonfarm establishments. Over the coming months, we will add chart sets for more releases. I’ve used the word “interactive” to describe these charts. Let me explain what that means. Interactive features let you choose what you want to see. For example, our chart showing nonfarm employment levels over the last 20 years starts out with two lines, one for total nonfarm employment and the other for total private employment. The legend above the chart lets you turn categories on or off, simply by clicking on the industry titles in the legend. If you want to look at, say, the last 10 years instead of the last 20, you can change the time period by clicking and dragging within the chart. If you hover your pointer over the lines in the chart, you can see the exact values for individual months. In the coming months we will continue to develop interactive graphics for the rest of our most watched monthly and quarterly news releases. Our goal over the next few years is to have interactive graphics to accompany all or nearly all of our news releases. I am thrilled to have this great set of tools to serve our customers better. Take a look. I know you’ll agree with me that the BLS staff have done a fine job crafting these ready-to-go visualizations. Whatever BLS statistics you follow, I hope you find many uses for them and send us a lot of comments and suggestions! A few weeks ago President Obama presented his fiscal year 2016 budget request to Congress. That budget proposes $632.7 million in funding for BLS, an increase of $40.5 million over our fiscal year 2015 funding. The 2016 budget proposes new funding to help BLS meet some important data needs. I have asked David Friedman, the acting Associate Commissioner for Prices and Living Conditions, to explain how we plan to use the proposed funding to improve prices and consumer spending information. The President’s 2016 budget asks Congress to restore funding that would let BLS continue producing and publishing export price indexes. These indexes measure the price change of goods and services U.S. firms sell to foreign buyers. In fiscal year 2014, we announced plans to stop publishing export price indexes because of reduced funding. However, before we carried out the planned cuts, the Administration looked for and found other temporary funding sources. This money is only enough to produce and publish export price indexes until September 30, 2015. This budget proposal would allow us to continue producing and publishing export price indexes in fiscal year 2016 and beyond. 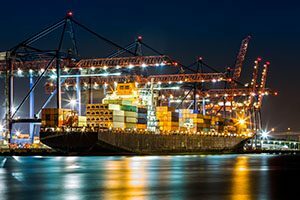 BLS publishes import and export price indexes, and both are critical for understanding how our nation’s economy connects to the world economy. Export price indexes help policymakers and businesses understand trends in trade balances and how well U.S. firms compete in international markets. The Bureau of Economic Analysis uses export price indexes to estimate real Gross Domestic Product, which measures all the goods and services the nation produces. BLS measures of productivity and costs also rely on export price indexes. A recent Beyond the Numbers article showed that no other data sources are substitutes for export price indexes. Release consumer spending data more quickly to help the Census Bureau produce alternative poverty measures each year. Add questions to the Consumer Expenditure Survey on topics such as school breakfasts and lunches and help paying for home heating and other household expenses. Continue research to improve how federal agencies measure poverty. If Congress funds the BLS proposal in the coming year, it would allow us to strengthen our partnership with the Census Bureau on this important national issue. Without the funding, our ability to be a full participant in development and maintenance of the supplemental poverty measure is not possible.